Ready to throw yourself out of a perfectly good plane? 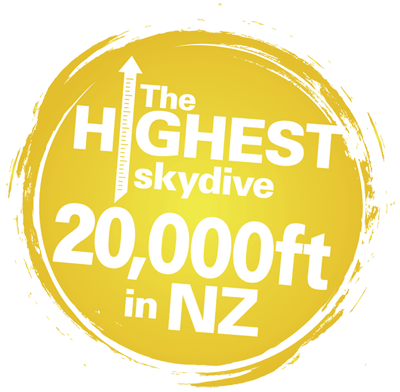 At Skydive Auckland we offer the highest tandem skydive in New Zealand, where you can jump from a thrilling 20,000ft. Imagine the excitement of freefalling at a speed of 200+ km/hr with a spectacular and unique backdrop of both the east and west coasts of New Zealand. After freefall you will enjoy the serenity of a beautiful parachute ride and see stunning views in every direction. As soon as you are down, you will want to do it all over again! With over 20 years in the industry, our Skydive Auckland team are committed to providing you with an exhilarating, fun and safe skydiving experience. Skydive Auckland is located in Parakai, an easy 45 minute drive from Auckland City. With free transport provided (subject to availability), Skydive Auckland is the ultimate tandem skydive destination in New Zealand. The BEST Skydive I've done!